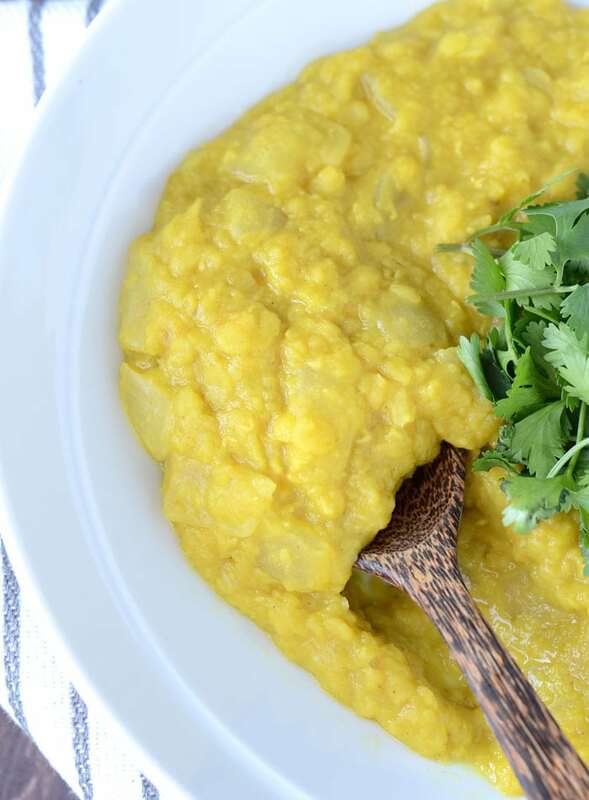 Coconut Red Lentil Dahl: Simple, delicious, nutritious, vegan. If you look up comfort food in the dictionary, coconut red lentil dahl is bound to be listed amongst the dishes that are good for the soul. It’s warming, flavourful, full of beautiful colour and makes for a very happy belly. It’s a perfect Fall dish and I know we’re not quite there yet, but I may be starting to dream of boots, sweaters, pumpkins and grey, rainy days. We only have a few short weeks of Summer left here in Vancouver, so I won’t wish for Fall just yet, but I’m glad it’s just around the corner. 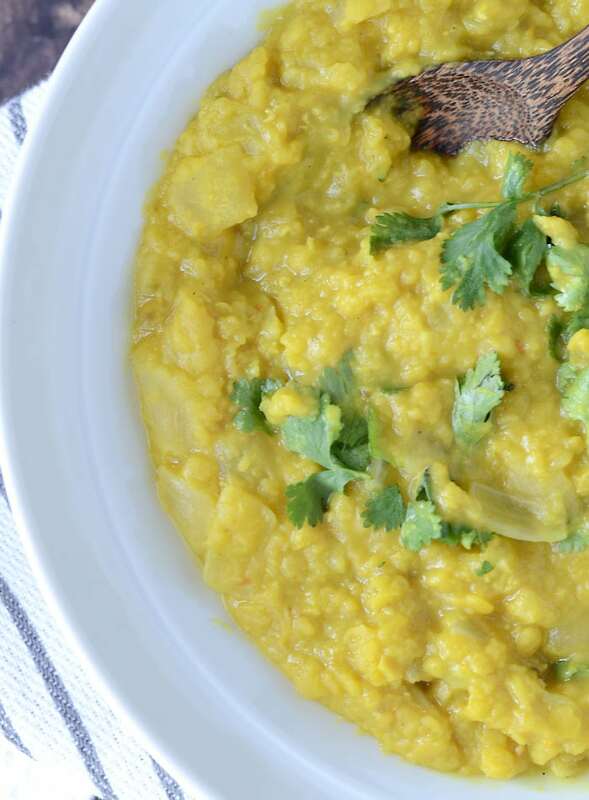 It’s such a wonderful season and a great time to get cozy with coconut red lentil dahl. This is an incredibly easy dish to make and it only requires a few everyday spices and ingredients. 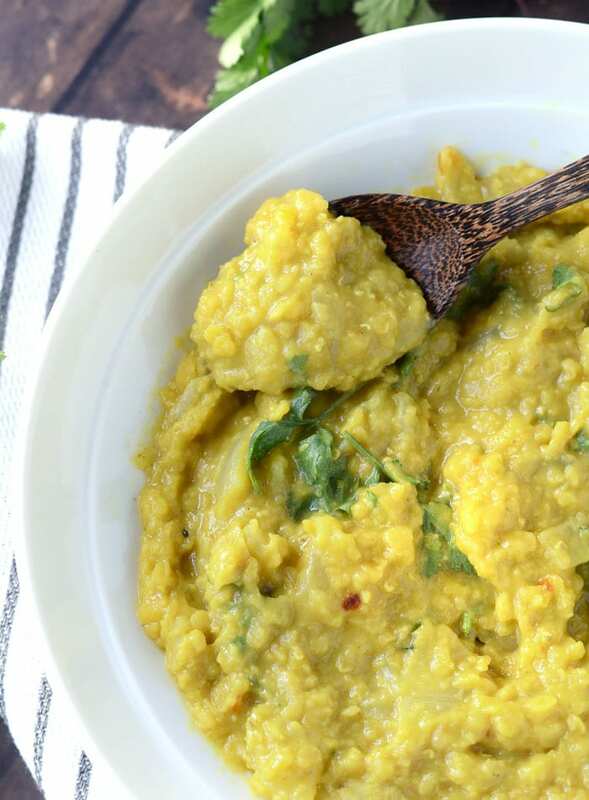 Aside from spices all you need are dried red lentils, canned coconut milk, onion and garlic. Basically you just add everything to the pot and let it cook. Slowly but surely, over 30 minutes or so your home will begin to fill with the fragrant smells of curry and coconut, two things that were just meant to go together. This dish is very high in plant-based protein, coming in at 19 grams per serving! It also high in fiber with 12 grams per serving. If you use light coconut milk, the dish is fairy low in fat, just 7 grams per serving however you can use full-fat coconut milk for a creamier dish. I’ve made it with both and it tastes great either way but I’d recommend regular coconut milk if you don’t mind a little added fat. 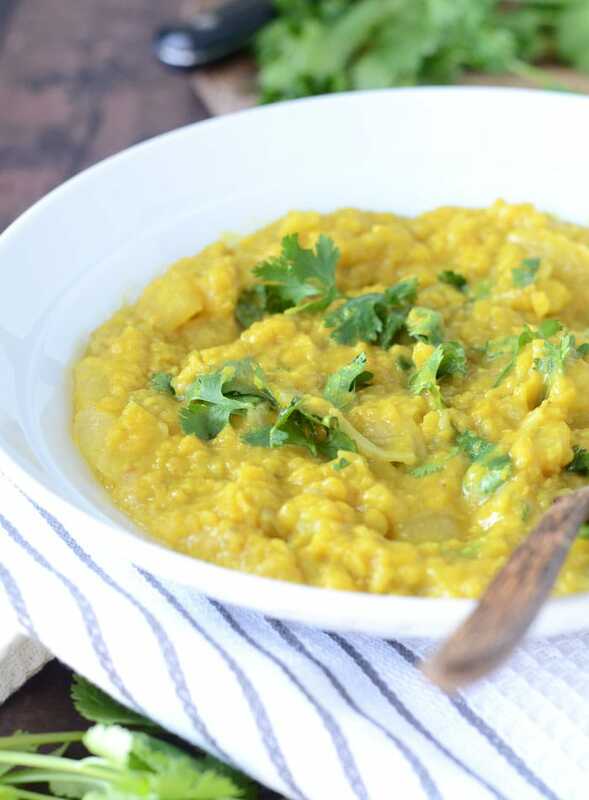 If you’re looking for a low carb dahl, you can always try my Cauliflower Coconut Dahl! This dish also has wonderful anti-inflammatory and immune-boosting properties thanks to the onion, garlic, curry powder and turmeric. Even more reason to enjoy it during the colder months, it’ll keep your immune system on it’s toes and ready to fight off colds. You can serve lentil dahl over brown rice and topped with fresh cilantro but it’s also amazing on it’s own. It’s also delicious served over a big bowl of fresh spinach and veggies for a healthy protein-packed power bowl. It’s also yummy with spinach, kale, carrots and cauliflower mixed in. The best thing about lentil dahl is it’s a breeze to make. All you need is one pot and about 30 minutes so it’s a very doable weeknight meal if you’re busy in the evenings. After chopping up your onions and garlic, toss everything in the pot and simmer until the lentils are soft and the dahl is thick. You can use either water or vegetable stock for the liquid, I’ve used both with good results but the vegetable stock adds extra flavour. You can keep this in the fridge for up to 5 days or so, the flavours only get better with time. It can also be frozen and de-thawed as needed. It’s incredibly filling, high in fibre, high in protein and packed with vitamins. Plus this recipe tastes even better the next day, so if you take leftovers to work like me or want to prep it ahead of time on the weekend, you’re in for a real treat. It’s easy, comforting, healthy, filling, high in fibre and plant-based protein…give it a try! Cook the onions, ginger and garlic in the coconut oil for 5-10 minutes, stirring frequently until soft. Add the spices, coconut milk, lentils and water or vegetable stock. Cook for 25-30 minutes until lentils are soft and it’s thickened up. Remove from heat and serve topped with fresh cilantro over brown rice, quinoa, or on it’s own. I’m soooo making this. Been stuck in hospital for 6 days since Boxing Day, and then I get dahl for lunch, and I thought I was in heaven, best hospital food ever! I even licked my plate. Wow this was delicious and so easy to make and especially after a long run outside. Thank you! This is awesome! Thank you Deryn. I just made this dahl, and it was super easy and quite tasty! Thanks for sharing the recipe! Delicious and easy…you’re the best! This recipe is superb !thanks sooo much this Dahl is just delishous !! Could I freeze this Deryn? This is the BEST Dahl EVER. It will be a regular dish for me. Thanks. Awesommmmeee!! So glad you liked it! I just discovered your blog recently when searching for vegan recipes. I made this recipe this evening, and served it with a pitta bread and a mountain of fresh coriander (or cilantro – I’m English!) – so easy and SO delicious. Can’t wait to try more of your recipes. That’s awesome! I love this recipe, it is so easy and delicious! Thanks for visiting! Thank you SO MUCH for this. This was so easy and so tasty. I used half light coconut milk and half regular (just estimated the amount) and used a little less water. It actually only took about 15 minutes to cook. Will be a regular for us. I used powdered ginger too, a scant teaspoon. Lovely! this recipe is terrific! i love this dahl alongside a little jasmine rice and a sliced avocado on top! This is amazing! I made a couple of changes. I felt like it was missing something so i added one cup of vegan chicken broth and then cooked it extra long to cook off the liquid. I also reduced the black pepper and skipped the red pepper flakes since I’m not a huge fan of pepper. I used light coconut milk. The only thing I wished was different was that I should have chopped th ginger smaller or cooked it longer. I will definitely make this again! I’m so glad you liked it! I love hearing that. I have a bit of a pepper problem so I probably add too much to my recipes anyways. Thanks for the comment! Trying this out as I post this comment, it’s looking good so far. I’m Indian and failed miserably at the pressure cooker method. Is there an alternative to coconut milk if I wanted to make this a staple meal? Coconut milk is the yummy option but a bit too high in fat. I have a very similar recipe for my slow cooker (with a carrot & tomatoes added). Your spices are slightly different & it’s just as lovely. Thank you. Would you mind telling me how would you modify this recipe for a slow cooker? For how long do you cook it? Thanks! I have tried a few different dahl recipes and none turned out tasting great (hot sauce was a great cover up, haha). Thank you sooo much for this one!! It is absolutely delicious!! Our house has been throwing in some vegan dishes. This is a household favorite. 🙂 Yummy! This is the second time I’ve cooked this dahl . It’s now a firm family favorite and my 8 year old granddaughter just loves it……Best I’ve tasted and so easy to make! It took much less time than stated in the recipe. The coconut milk is so delicious. I often make dahl for a quick mid week meal but never with coconut milk. I was unsure of using chili powder so I added much less than than called for. I think I will leave it out entirely next time. I prefer it not to be in my curry. But other than that, this was very tasty. It’s not often I comment on these but I just made this recipe and it is wonderful!!! And what more is there to love that the amazing-ness goes all into 1 pot? Thank you for this deep and flavorful dish! Thanks! I’m looking for kid friendly vegan meals — and this one is sure to be a hit! I’m not sure if I should simmer it covered or not? I’ll try a mix for the first time. Is’t simmering now. Stay tuned! Thanks! This is my new favourite recipe! It’s become a weekly standard. It freezes great for work lunches and I leave out all the peppery ingredients so my four year old will eat it. Then the adults add it back in at the table 🙂 Thanks for this simple but delicious recipe! Could I use green lentils instead?! How high should the heat be and should it be covered? Thanks! Which size can of coconut milk do you use? Was looking for a dal recipe using coconut milk. Had less than two cups masoor dal but used same amount of everything else. Added 3 small plum tomatoes to onion mixture, needed a bit more salt and red pepper and cooked for a full hour. Delicious. Yes, you should be able to use green lentils it just won’t be quite the same consistency and yes, feel free to add other veggies. Enjoy! Beautiful Dahl! I added some kale to mine for some extra greens and protein – going to become a weekly staple I think! Great idea, I love adding spinach or kale to mine too! So glad you enjoyed it! I’ve made a few dal recipes I’ve found online in the past and while they were pretty good, this one is by far the best! The coconut milk totally makes it, and the amount of spice is perfect. I literally just finished eating 3 plates of this over basmati rice. So good, though I’ll need to do better with my portion control next time. Lol. Thank you for such an awesome recipe! 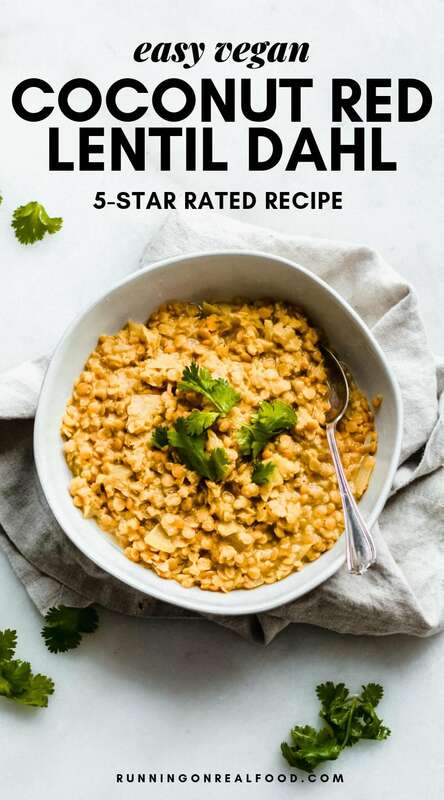 I also had red lentils and some left over coconut milk on hand and found this recipe … I could make it with what I had in my pantry and it was SO EASY and DELICIOUS! Thank you for sharing. This will go into rotation for nights when I need something quick for me and my mom. Wonderful! I’m so glad you enjoyed it. Thanks for your comment. Ummm, YUM! I’m newly vegan and love your website. All your recipes are so easy, healthy and delicious. Thank you so much. I’ve made this recipe twice now and i LOVE it! I add kale for some extra greens and protein. Yummy and easy! Yes! I love this recipe so much too and it’s awesome with added spinach or kale! Nice! Sounds amazing. Yes, I love this recipe for comfort food. So good. Just found your website and made this yesterday. Wow! It’s so good and easy to make. I have severe health problems and struggle to cook, but this was easy and delicious. I’ll definitely make it again. Thank you! I’m so happy to hear you enjoyed it, Katherine! I love this recipe, it’s one of my all-time favourites. Thanks! Wait, is 625g really the weight of two small onions? Apart from that boggling weight I am wrapt with this! Thanks for replying to literally every person except me! My apologies, Mem. I get a lot of comments on my site and sometimes a comment gets lost, it wasn’t intentional but sorry I missed yours! I did measure everything exactly so it should be correct but I wouldn’t worry too much about the exact weight of the onions, two small onions or one large onion should do the trick! I made this yesterday for lunch today, and it was absolutely delicious. Thanks for such a tasty and quite easy recipe! I just made this, and added chopped red potato. This recipe is awesome and easy. Thanks for sharing! By far the best dhal that I’ve ever had. Comforting and absolutely addictive. Flavors are even better the next day. Thank you for a great recipe. It’s become a staple. Yes! So happy you enjoyed it. I love it too, and ya the flavours totally get even better the next day! Thanks for the feedback. Definitely the best Dal I’ve had!!! I made it in the instant pot, added a bit more water, and made it oil-free, and it’s still delicious! This has already been placed in my favorite recipe binder to make next week. Can’t wait to see how the flavors improve even more when I eat it tomorrow 🙂 Thank you for this recipe! Amazing! Thanks for the feedback for making it in the Instant Pot. I usually make it oil-free now too, you don’t really need it so can definitely leave it out. So happy you enjoyed it! Yum, this was so fab! I had all the ingredients in the cupboard and was so easy to whip up. Loved it! Couldn’t stop eating it! Such wonderful comfort food and really easy to make. You’re so welcome! This makes me so happy! So glad you enjoyed it. So very happy if you enjoyed it! 100% Indian-inspired, I love Indian dishes! Thank you so much for sharing this! I’m learning how to cook so I can survive off more than in-n-out and prepackaged mac and cheese with soy meat and tomatoes which took me too long to realize was not vegan. I made this and it turned out great. I couldn’t believe it. I was so worried and expecting it to be trash and taste okay but not like dahl but wow this is restaurant quality! It was pretty easy to follow as well, the ingredients aren’t exotic, extravagant, or expensive, the serving doesn’t leave you wanting for more (with rice) and its guilt free. I am truly just over the heals in love with this! For the instructions I was not sure of the heat setting (again new to this) to put the lentils on (ended up being medium high without boiling that worked best). Could you write a bit more explanatory or descriptive for the newbies like myself . I needed a bit more coconut oil, 4 cups of broth and another cup of water possibly due to the heat issue. I added someone salt, pepper, tumeric, and curry powder to adjust the additional liquids that decreased the flavor (careful with tumeric!). It still came out great, I was so proud, I had to take a picture..Couldn’t do it without you, thanks so much! Hi Janet – Thank you so much for your comment, it means a lot to me to hear that!! I’m so glad you enjoyed it. You’d want to cook this over medium heat, keeping it at a light simmer. I’m not totally sure why you’d need so much extra liquid but it could be effected by the elevation and temperature where you live as well as the lentils you used, some might take a little longer to absorb the liquid than others. No big deal, you figured it out! So glad you liked the recipe, best of luck on your new journey to eat a whole food, plant-based diet. You can do this! I am going to make this today. i already have chana dal peas in my cupboard. do you think those would work or should i buy lentils? I’ve never made dahl or curry with chana dal beans but I think it should have about the same result. You may need to adjust the liquid and cooking time though. Let me know. This is so good! Will definately be in my regular rotation! Amazing, so happy to hear that!! Thanks for letting me know. Delicious and warming!! I love the subtle coconut flavor. Yay, so happy you enjoyed it!! “It can also be frozen and de-thawed as needed”. This is my new “died and gone to heaven” comfort food! Can’t wait to try the leftovers tomorrow. Spooned my first serving over some mashed potatoes…yummy!!! Just made this – and it is one of the most delicious things I’ve made. I will take it to work over the next few days to have with brown rice ,Bulgar wheat and quinoa. looking forward to how the taste develops over time. It totally gets better the next day! I’m so happy you enjoyed it. Thanks for the comment! First shot at a dhal or even trying lentils. I couldn’t find red lentils so I used what I could. I am amazed at how easy and delicious it was. Right? It’s the best! Glad you liked it. Wow! This is superb. First time I’ve ever tried to make dahl and this recipe seems too easy considering how wonderful it turned out. :)) I reluctantly used lite coconut milk since I have a hard time digesting fat, but I was pleasantly surprised that it still tasted great! Thank you! I look forward to making this again, and also have a feeling that the leftovers will be tasty tomorrow. So glad you liked it, Sarah! I pretty much always use light coconut milk for this…I find the full-fat just too rich. It still works great, like you said! Thanks for the comment. Oh yeah! Wonderful especially on a cold rainy spring day. I tuned down the fat a bit by using 1/2 can of low fat coconut milk and added a 16 oz. goya coconut water. The rest was water and homemade veggie stock. So glad you liked it! Interesting to use coconut water, I’d never thought of that in a recipe like this. Thanks for your recipe, we are enjoying it very much. It is delicious! I’m a dahl lover and this recipe seems the best so far, easy and having all ingredients at home except the coconut milk in tin but a carton of it…I may try with that and see how it works….If not, next tie I will get a tin of milk. Holy cow this is good! I am new to whole food plant based cooking but not new to Indian spices and flavors. This is wonderful. Thank you for a fool proof and versatile recipe. I love this recipe so much that I kept a written copy in my kitchen. I gave my hard copy to a friend who came over and loved it too. Back online the recipe looks a little different. Did an older version of it have chili powder in it? This was DELICIOUS!!!!!!! We upped the curry a bit, but the base recipe was just simple and truly yummy. So very glad you enjoyed it! It’s one of my favourites too. I just made this recipe, and it took me about 40 minutes, because of the prepping of the garlic ginger and onions. It’s really good, I made quinoa to go with it and avacado on the side. Love it, maybe I’ll have a glass of wine or a beer to go with it. I think this recipe deserve 5 stars. Thanks! I’m so happy you enjoyed it! Sounds perfect with a glass of wine or a beer 😉 Enjoy! I just made this, and it tastes delicious!